Having an ultra high definition monitor is important whether you would just like to use it for entertainment purposes or professionally edit the footage you captured with your 4K video camera. Within just a few years, 4K monitors have become the industry's standard and their price has made them available to common users. With so many models on the market today, choosing the right 4K monitor might seem easier than it actually is. Contrast ratio, brightness or low input lag of the monitor can be some of the crucial factors that should all be taken into consideration when purchasing a new 4K monitor. The Lenovo company has established itself as one of the leading 4K monitor manufacturers and their ThinkVision X1 model is still one of the best 4K monitors on the market more than a year after its initial release. Lenovo's elegantly designed 4K monitor with a ridiculously slim body is both affordable and capable of superb performances. We have put together an extensive review of Lenovo's ThinkVision X1 4K monitor in order to provide you with all the essential information you might need if you are contemplating about getting this remarkable 4K monitor. The Lenovo company pays a lot of attention to the visual appearance of their 4K monitor models, which is why ThinkVision X1 looks smart and practical. The Chinese computer hardware manufacturer has been known for quite some time for their minimalist and functional designs. The Lenovo ThinkVision X1 4K monitor has an industrial and yet sophisticated design that is characteristic of all ThinVision series models. The first thing that catches the eye is the X1's almost 2mm bezel screen that makes the monitor appear smaller than other 27-inch monitors. With the dimensions of 24.19 x 19.35 x 10.63-inches, it is one of the world's slimmest 4K monitors. 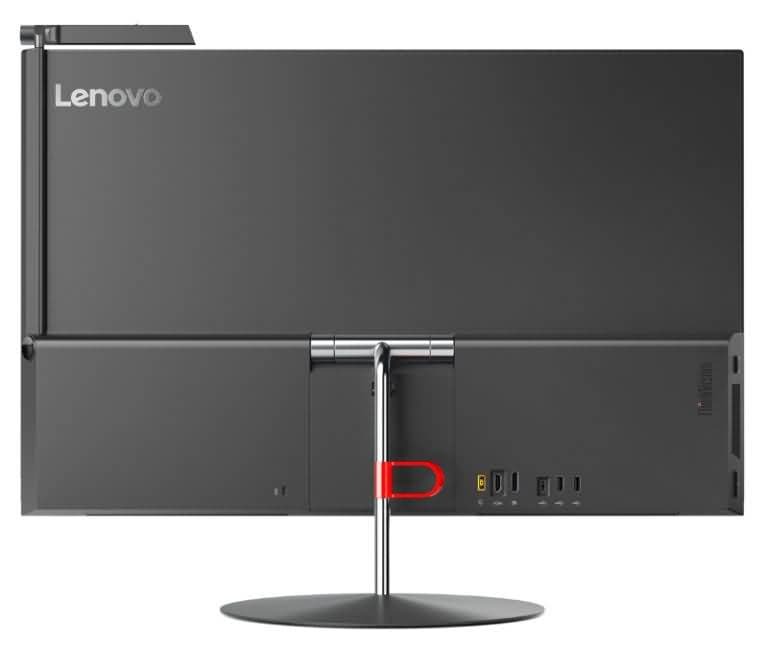 The Lenovo's X1 model has an aluminum frame instead of the plastic one, most of the 4K monitors of its class have, which gives it a sturdy look. The wine-glass shaped stand with a circular base has a tilting range from 22 degrees to and -5 degrees. Like most slimmer 4K monitors X1 is somewhat limited in articulation since its cabinet can't hold too many attachments, but the monitor's stand can be detached and users can use some of the mounts that can hold more weight. The Lenovo ThinkVision X1 4K monitor comes with a built-in 1080p camera that is positioned in the upper right corner of the monitor. With the camera swivel range of 180 degrees, the X1 users can adjust the camera position to best suit their needs. The Lenovo ThinkVision X1 4K monitor is equipped with a number of ports that enable the users to connect devices directly to the monitor. It features a full-function 3.1 USB Type C port that enables the users to use the X1 as an external display or a charging dock for devices such as the MacBook 2016. In addition, the Lenovo's ThinkVision series model features HDMI 2.0 and DisplayPort 1.2 ports that can support UHD resolutions at up to 60 Hz. Furthermore, the users can connect speakers or headphones via the audio jack or play audio files in HDMI, DP, Type-C or USB modes. The X1 is also equipped with built-in 3-watt stereo speakers that enable you to use this 4K monitor independently from any other external speakers and sound systems. 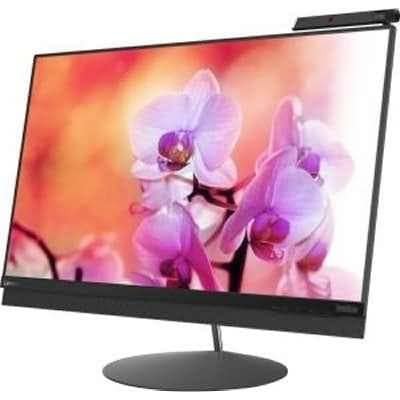 The Lenovo Think Vision X1 monitor offers a wide array of options through its connectivity features which make it a reliable 4K monitor that can be used for different purposes. Besides the remarkable looks, the Lenovo ThinkVision X1 4K monitor offers a plethora of features that make using this ThinkVision series model a pure joy. The X1 is capable of high-end performances that bring the user's gaming or movie-watching experiences to a new level. The X1's 27-inch display has a native 3840 X 2160 resolution at 60 Hz refresh rate with 16:9 wide screen aspect ratio. In addition, the screen has a 178-degree horizontal and vertical viewing angle that makes sure that the image quality doesn't deteriorate when it is viewed at an angle. The X1's display has a pixel density of 157ppi, which means that the details of the images displayed on this monitor are sharp and clear. The menu of On-Screen settings is easy to use and it allows you to calibrate the X1 without much effort. The On-Screen options enable the users to control volume levels of the speakers and microphone, monitor's color properties or to have direct access to Brightness and Contrast settings. The left and right arrows allow you to browse through the ThinkVision X1's properties with ease, while you can also use them to scale images in any way you want. The Lenovo ThinkVision X1 an IPS (In-plane Switching) display type that can support a wide array of different screen resolutions ranging from 640 X 350 pixels to 3840 X 2160 pixels. Lenovo's 4K monitor has 1300:1 Contrast ratio, while DCR feature enables the dynamic contrast ratio that allows the high-definition images to appear in vivid colors. The monitor has a maximum Brightness value of 300/cd m2 which is a big factor contributing to the overall image quality X1 is capable of producing. o ensure the best possible performance to its users Lenovo has enriched its ThinkVision model with a 1.07 billion color support that enables the richness of color and wide color range. Even though the monitor's size is not best suited for professionals who deal with high definition photos and videos and require a screen with a larger diagonal, the image quality the X1 can display on its screen is more than enough to provide a great viewing experience to users who would like to streaming a Netflix movie or work on an Excel worksheet. 1.07 billion color support speaks volumes about how well Lenovo ThinkVision X1 manages colors. To make things even better the X1 allows its users to adjust colors according to their needs. Under the Image Properties option, there is a Color option that enables you to adjust the intensity of Reds, Greens, and Blues. Preset modes offer the users a choice between Natural, Blueish, sRGB and Reddish options that automatically adjust the color values displayed on the screen. The custom mode enables the users to increase or decrease the levels of Red, Green, and Blue manually and save the customized changes. There is no doubt that Lenovo's X1 4K monitor can display vivid and lifelike colors because of its wide color range and a plethora of settings that enable you to adjust the color values manually. However, the X1 is not HDR-enabled which can be a downside for users who would like to look at HDR content on their monitors. Unlike the CRT monitors that require higher refresh rates to minimize the flickering, the LCD technology used on the X1 is entirely flicker-free. With 60 Hz refresh rate at native resolution and a maximum refresh rate of 75 Hz at lower resolutions the Lenovo's ThinkVision 4K monitor is a decent performer, but still, leaves much to be desired for. The X1's response time is 6 milliseconds which is two times more than the response time of some of its competitors. If you are looking for a monitor that can effortlessly support demanding graphics the X1 is probably not the best choice, although its response time and refresh rates are more than satisfying for less demanding tasks. Even though the Lenovo ThinkVision X1 4K monitor is capable of providing a high image quality there is nothing that makes it stand out in the sea of 4K monitors in its price range except the fact that it is the world's first 4K monitor that has a TUV Eye Comfort certification. This means that the X1's blue light filter, flickering and other unwanted and eyesight damaging effects are well within the safety zone. The Eye Comfort certification makes the ThinkVision X1 4K monitor an excellent choice for work environments because it protects the health of the people who spend large quantities of time in front of this monitor. The Lenovo's ThikVision 4K model is designed for industrial or business settings since it favors utility over visual performance. X1 is probably better suited for a factory control display or a classroom than it is for a home desktop computer. The limited availability of the X1 model further supports this claim, since it appears that Lenovo would rather distribute this 4K monitor through the OEM companies. Regardless, the Lenovo ThnkVision X1 model is a reliable 4K monitor capable of delivering high-resolution images in lifelike colors and for that reason it a great buy for most common users.